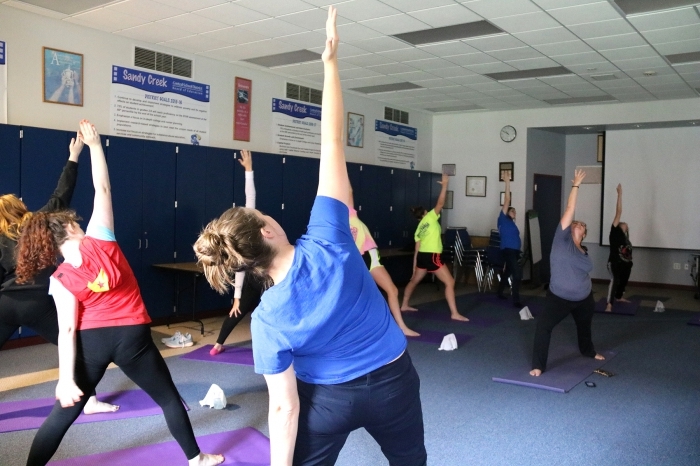 Kit Sheehan, (at right center) a certified yoga instructor and science teacher at the high school, leads students in a yoga class at the school. Sandy Creek High School has a new elective course that brings a wide range of mindfulness to students at the school. Taught by Dori Hathway and Kit Sheehan, the goal of the class is to expose students to techniques that will help them achieve social and emotional growth coupled with physical fitness in a safe and nurturing environment. The class will explore options for well-being that include yoga, nutrition, non-pharmaceutical medicine, exercise, inner reflection, positive thinking, aroma-therapy, trust building and more. One module of the program focuses on yoga and its healthful benefits are welcomed by the students participating. Each class begins with a positive affirmation statement that begins, I am and students select from a list of positive statements that may include: strong, positive, grateful, unique, or others that reflect on what the students need is for at that time. The room is softly lit. Quiet, calming music plays as Sheehan leads the students through a series of fluid yoga poses. She quietly talks the students through the exercise as she explains the benefit of the pose on a particular muscle group, reminding students of proper technique and the importance of breathing deliberately and consciously during the session. The exercises serve to increase core strength, flexibility, focus, balance, and inner strength among other physical benefits. An added bonus is the emotional reward that students also extolled the benefits of, citing relaxation and stress relief as key factors in their personal experience from the class. I feel happier after the class, said Gabe Baird, who credits the class with helping to relieve some of the stress that comes in high school. For senior Kennedy Sullivan, yoga has provided stress relief from the college level courses she is taking at the school. Sheehan and Hathway are excited about upcoming aspects of the class that include a field trip to a ropes course that will rely on trust and group involvement, pushing students further emotionally and physically. Also, on the horizon are guests in the class which will bring information and experiences on topics such as: soulful hooping, acupuncture and acupressure, aroma therapy, nutrition and more. In its first year, the program has been well received by the students and the holistic community. Alumni from the school will be participating in future presentations and the instructors are excited for the opportunity to bring in successful individuals who were once Sandy Creek students just like the students in the class.